Horizontal Wine Box for 3 Bottles. Bordeaux, leather effect finish, material cardboard. Dimensions (L x D x H) cm: 34 x 28 x 9. Assembly is simple and does not need any tool: simply fold the box along its edges. Note: The box is delivered already folded. It does not include bottles of wine. 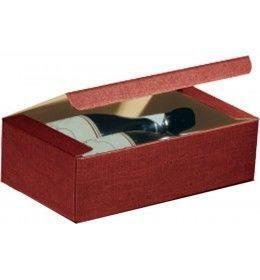 Horizontal Wine Box for 3 Bottles. Bordeaux, leather effect finish, material cardboard. Dimensions (L x D x H) cm: 34 x 28 x 9. Assembly is simple and does not need any tool: simply fold the box along its edges. Note: The box is delivered already folded. It does not include bottles of wine.